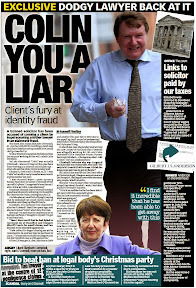 How a solicitor and an accountant from the Scottish Borders ruined my family and how the Law Society covered it up. 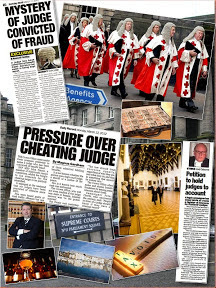 As many of this blog are now well aware, the Scotsman newspaper and other media outlets wrote many reports on developments in my case against crooked lawyer Andrew Penman of Stormonth Darling Solicitors, Kelso and crooked accountant Norman Howitt of the JRW Group in the Scottish Borders, the two so called 'professionals' who swindled the estate of my late father and got away with it due to self regulation of solicitors and accountants in Scotland. 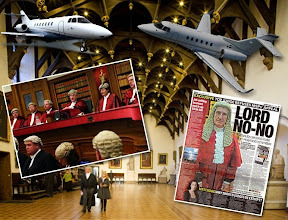 Mr Howitt was the Executor, and Mr Penman was his legal agent - and when a crooked Executor and crooked lawyer team up, there's not much hope for honesty ... and Mr Howitt, not content with ruining the legal & financial affairs of my late father, did the same to my mother, insisting she pass all her assets to him for reasons of wanting to keep all the money for himself. 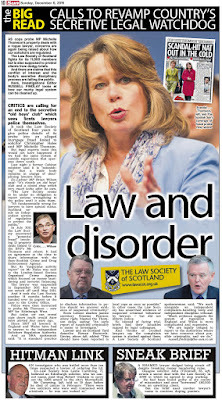 Some have been asking to understand a little more of my case against Drew Penman & Norman Howitt, so in light of a recent story in Scotland on Sunday passed to me by a Scotsman journalist I had completely forgot about (the one where I was going to take legal action against the then Scottish Legal Services Ombudsman, Mr Garry S Watson, who was just as terrible at his job as the Law Society of Scotland are at handing complaints against crooked lawyers, here in today's article, are the reprints of the Scotsman & Scotland on Sunday reports on my case, and campaign to bring independent regulation of lawyers in Scotland.I trus tthey are of use to some readers who suffer the same problems in dealings with the legal profession. 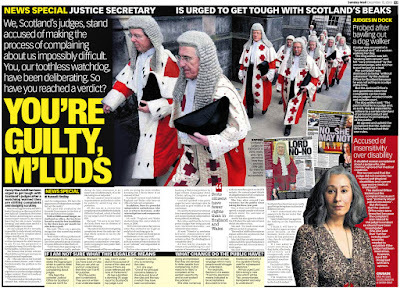 It should be noted this article is an update from the previous article featuring the Scotsman reports due to graphical and code changes on this blog. A 20-year old man from Jedburgh speaks of disinheriting himself after battling almost five years for a share of his father's £300,000 estate. 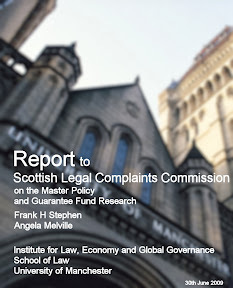 He has lodged an official complaint with the Law Society of Scotland seeking an inquiry into the alleged failure of administrators to settle his late father's affairs. 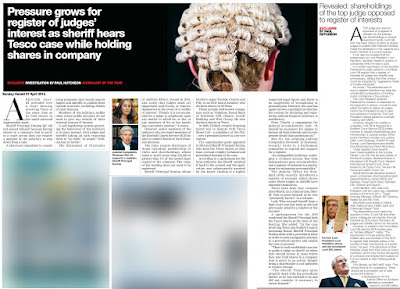 In his letter to the Law Society, Mr Cherbi names the accountant Norman Howitt of John Welch & Co, the estate's executor, and the solicitor Andrew Penman of Kelso law firm P & J Stormonth Darling, legal adviser to Mr Howitt. None beneficiaries named in his father's will who were to receive legacies ranging from ｣500 to ｣2000 have not been paid, according to Peter Cherbi. They include relatives in Italy and France and neighbours in Jedburgh. At the time of his death at the age of 72, he had a wide ranging portfolio of shares, unit trusts and bank accounts as well as property. He was also the proud owner of a classic 1950s Sunbeam Alpine Mark 3 motor car. In 1990 a Kelso garage valued the car at ｣4000. According to Peter Cherbi, it was sold in 1993 for £1,200, although he had received a higher offer. 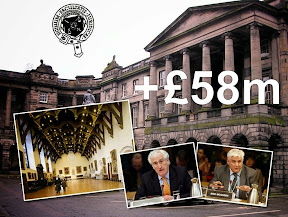 A document drawn up in1990 showed the estate to be worth £257,211 exclusive of Italian assets. The family had expected administration to take two years. Mr Penman said "Some of the issues Mr Cherbi has raised with you have been dealt with. some others are new allegations and comments" Mr Cherbi should have raised his concerns through his lawyer or wth the executry, he said. 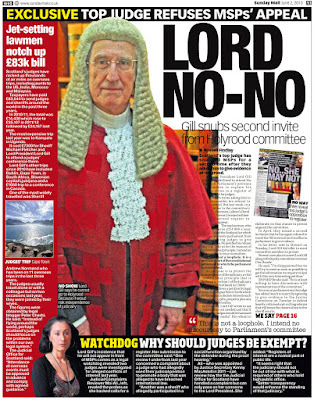 The Law Society investigation concluded that Mr Penman, of the Kelso law firm of P & J Stormonth Darling, should be prosecuted by the tribunal for the "appalling" way he handled the executry of Gino Cherbi, a Jedburgh businessman whose estate was valued at £300,000, after his death in 1990, aged 73. 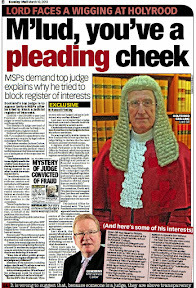 When The Scotsman spoke to Mr Penman, he said the complaint against him had been thoroughly investigated by the Law Society and that was an end to the matter. 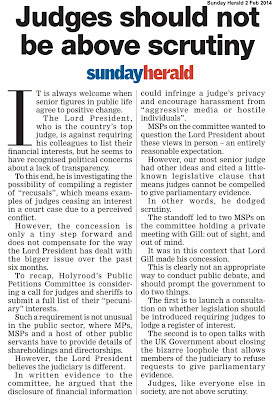 In general, he could not make comments because of confidentiality. 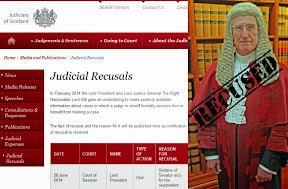 The law Society report outlined lengthy and unexplained delays and a repeated failure by Mr Penman to respond to correspondence. It also alleged a complete lack of proper management in the handling and progressing of the executry. Peter Cherbi was to have been the main beneficiary from his late father's estate. Others named in the will were to receive legacies ranging from £500 to £2000. But Mr Cherbi has been told there are no funds left in the estate. 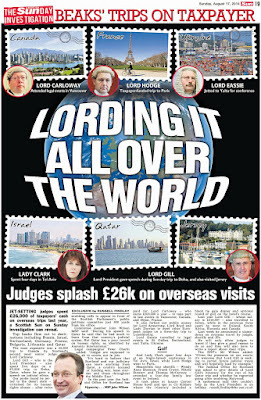 A document showed the estate to be worth £257,211 exclusive of Italian finds. 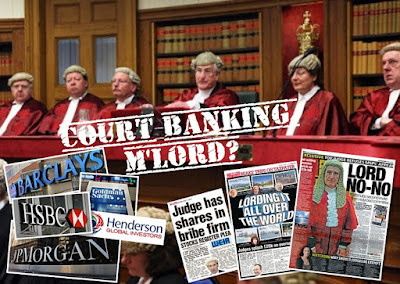 The overseas assets included an account with the Banco di Roma containing some £26,000 which was not collected by the executry. 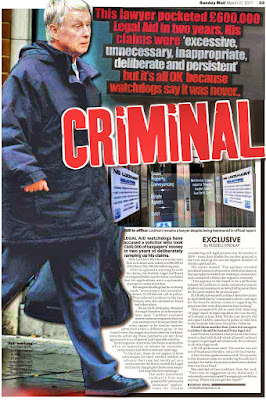 The Society report states that Mr Penman apparently attempted to mislead the Royal Bank on this matter. 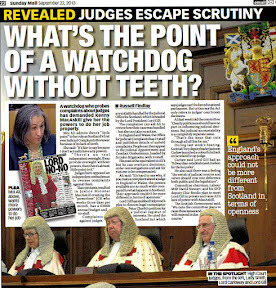 The committee of the Law Society which first considered the report in June this year expressed grave concern at the way the executry had been handled. 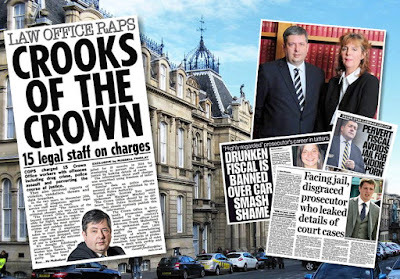 Members agreed that Mr Penman's actions were so serious and reprehensible as to amount to professional misconduct and recommended prosecution by the Scottish Solicitors Discipline Tribunal. 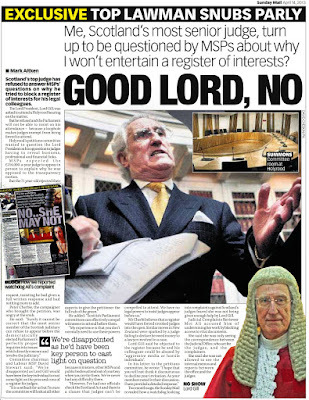 Mr Penman also apologised to the complainer (Mr Cherbi) and to the Law Society. 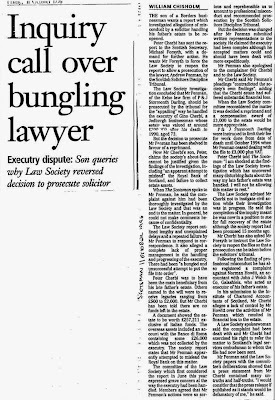 WHen the Law Society committee reconsidered the matter, it was decided a reprimand and a compensation award of £1000 to the estate would be more appropriate. 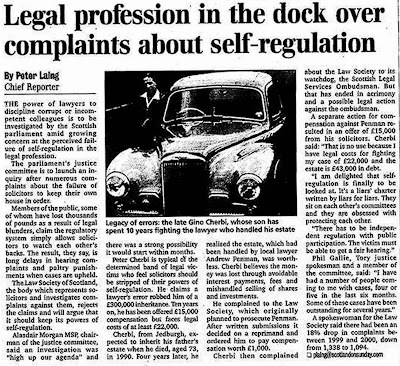 P & J Stormonth Darling were instructed to limit their fee for work done from the date of death until October 1994 when Mr Penman ceased dealing with the file, to £3000 plus VAT. 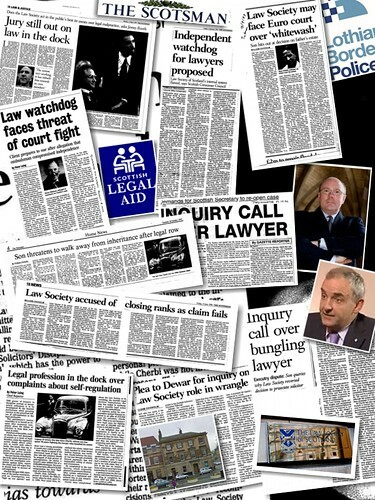 The original investigation by the society into the way Andrew Penman, of Kelso law firm P & J Stormonth Darling, dealt with the £300,000 estate of businessman Gino Cherbi, of Jedburgh, concluded that the solicitor's "appalling" handling of the matter warranted prosecution before a tribunal. 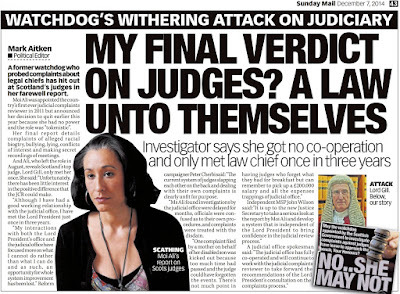 "It is unclear why the committee changed its view with regard to prosecution after having heard personal representations from the solicitor's council member. 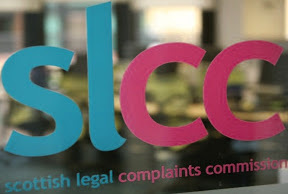 It is recommended that the complainer and the ombudsman are advised of these reasons"
However, the Law Society has accepted the criticisms levelled at it by Mr Watson in relation to the delays and has sent Mr Cherbi a cheque for £250. 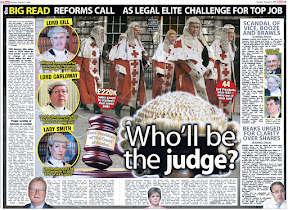 Mr Cherbi yesterday attacked the "shabby treatment" he has received from the Law Society and claimed that the ombudsman appeared to be powerless when the society closed ranks to protect its own. 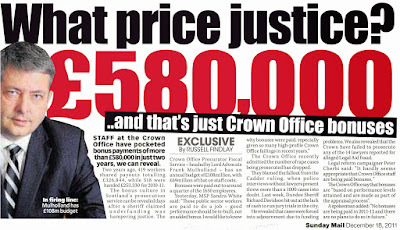 He described the £250 "pay-off" as an insult. 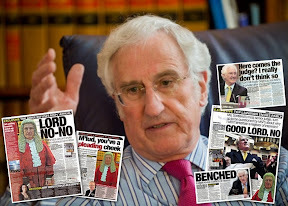 "I feel I owe it to my father's memory not to let this matter drop and have instruced my solicitor to apply for judicial review so that Mr Penman can be prosecuted" Mr Cherbi said. 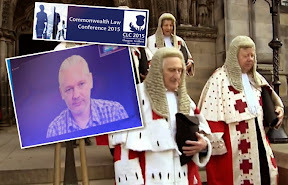 "If necessary this issue will be taken to the European Court". 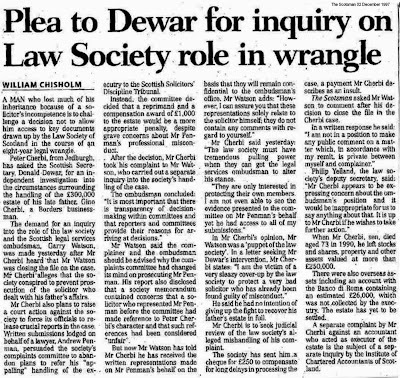 Peter Cherbi, from Jedburgh, has asked the Scottish Secretary, Donald Dewar, for an independent investigation into the circumstances surrounding the handling of the £300,000 estate of his late father, Gino Cherbi, a Borders businessman. Instead, the committee decided that a reprimand and a compensation award of £1000 to the estate would be a more appropriate penalty, despite grave concerns about Mr Penman's professional misconduct. After the decision, Mr Cherbi took his complaint to Mr Watson, who carried out a separate inquiry into the society's handling of the case. 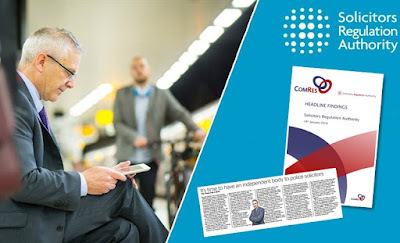 Mr Watson said the complainer and the ombudsman should be advised why the complaints committee had changed its mind on prosecuting Mr Penman. The society has sent him a cheque for £250 to compensate him for long delays in processing the case, a payment Mr Cherbi describes as an insult. When Mr Cherbi, senior, died aged 73 in 1990, he left stocks and shares, property, and other assets valued at more than £250,000. 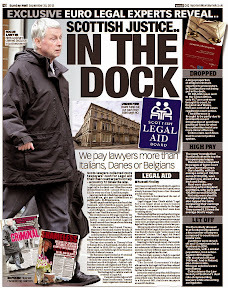 There were also overseas assets including an account with the Banco di Roma, containing an estimated £26,000. which was not collected by the executry. The estate has yet to be settled. We do not expect, having purchased our dream home, to find that planning permission has been granted for a new motorway to run through the garden. 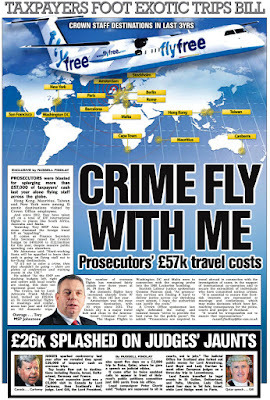 And we would be more than a little upset to discover that a trust find set up to look after our elderly and ailing parents had actually furnished our solicitor's holiday apartment in Spain. 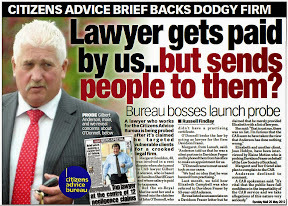 So, who doo you turn to when you believe your solicitor has made a mess of your affairs ? 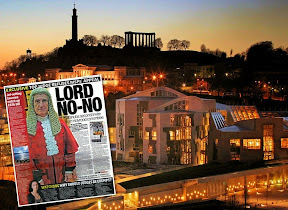 Among the members of the group, one of the newest and angriest is Peter Cherbi, a man who lost his interitance because the winding up of the estate of his late father, Gino Cherbi, was bungled by his solicitor, Andrew Penman, of P & J Stormonth Darling in Kelso. 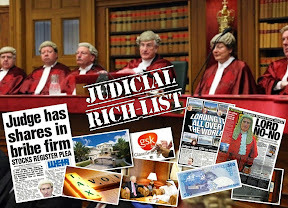 When Cherbi senior died in 1990, he left stocks and shares, property, a car and other assets including an account in the Banco di Roma, worth nearly £300,000. 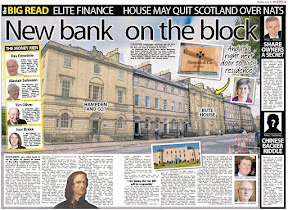 The Borders businessman's will included a few legacies to friends and relatives, and after liabilities were met, the residue of the estate was to go to his son, Peter. 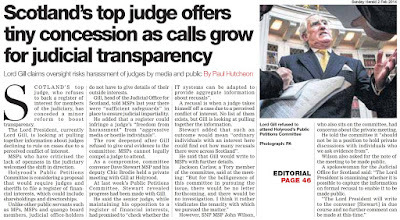 But the complaints committee changed its mind after reading confidential representations from Penman. and hearing in private from Penmans's solicitor. Cherbi says he was later told that at the committee hearing, Ness had questioned his character, and said Penman did not deserve to lose his career over such a man. Eventually the committee decided instead merely to reprimand Penman, and it awarded the estate what Cherbi thought was a derisory £1000 compensation. This is the statutory top limit that the Law Society can award for the anxiety and distress caused by an incompetent solicitor. 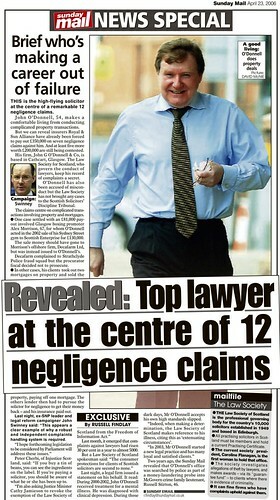 If a complainer wants compensation for his loss, he must sue for negligence through the courts. But while there is undoubtedly still a phalanx of people like Cherbi, who seem to have very good reason to feel aggrieved, there is some evidence that the problems of the early and mid-nineties may be becoming a thing of the past. 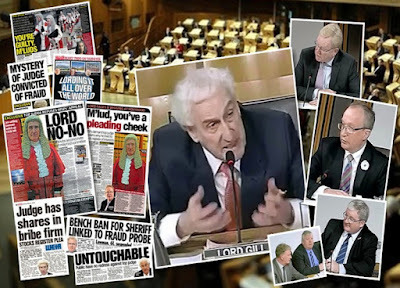 Peter Cherbi from Jedburgh, claims that his late father's £300,000 estate has been ruined and rendered worthless becuse of the way a Borders lawyer, Andrew Penman, handled the affairs of Gino Cherbi who died in 1990. 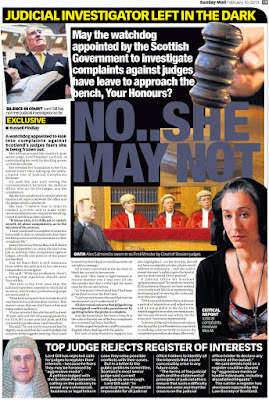 Mr Cherbi, who is calling for " more than a slap on the wrist" then took the case to Garry Watson, the legal services ombudsman. 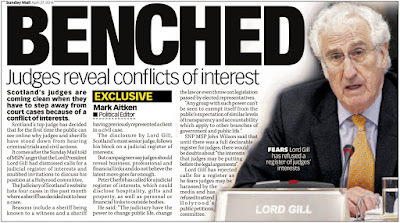 He criticised the society's handling of the complaint and said it was unclear why its committee had changed its view about prosecution. Mr Watson asked for the case to be re-opened so that the question of loss to Mr Cherbi could be fully addressed. 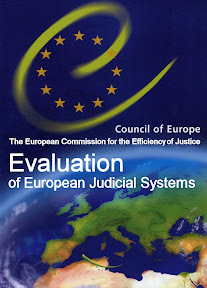 But the society decided that course of action was not competent in terms of the law, which emant the ombudsman's recommendation could not be acted upon. 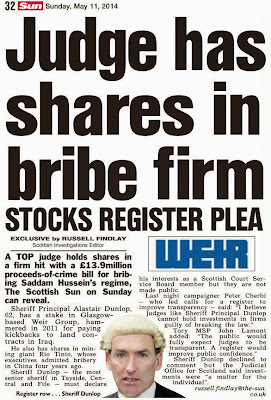 Instead, Mr Cherbi received a cheque for £250 to compensate him for delays in processing the inquiry. 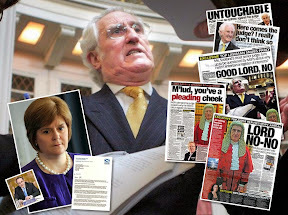 Mr Cherbi revealed yesterday that Henry Mcleish, the Scottish Home Affairs Minsiter, had twice advised him to seek independent legal advice about any further action he might wish to take. 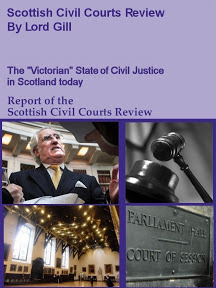 In the stufy, 415 people were interviewed by the SCC. 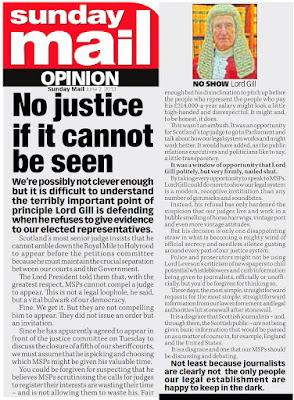 Even looking at those whose complaints against their solicitors were upheld, shows that a third felt they had been unfairly dealt with. 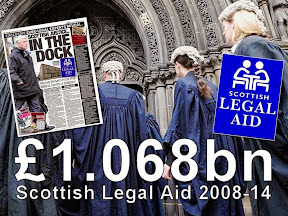 More than a fifth of solicitors refused to investigate complaints and 40% of people were ignored, "fobbed off", told to change lawyers, or advised not to complain to the Law Society. 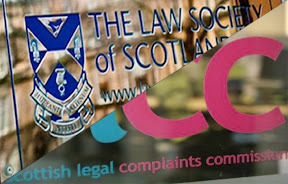 The SCC wants the Scottish parliament to review the Law Society's complaints procedure, with a vew to establishing an independent complaints body. 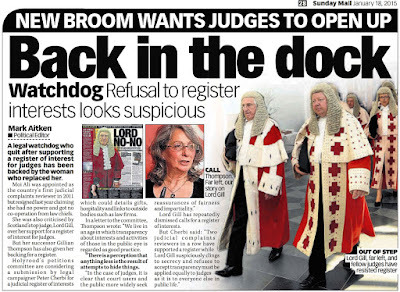 Gary Watson, the Scottish legal services ombudsman said he remained opposed to an independent body "While I endorse a number of the recommendations made in the report but I would disagree with the principle recommendation for the establishment of an independent complaints body. 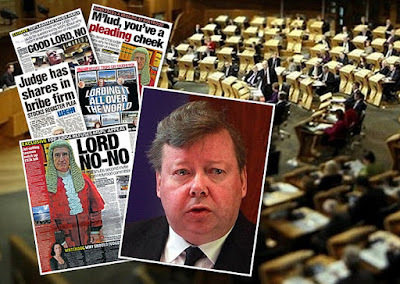 Mr Cherbi, from Jedburgh believes his father's £300,000 estate was effectively made worthless by the lawyers handling of his affairs. Cherbi's case started in 1990 when his 73-year-old father died, leaving behind an estate valued at around ｣300,000. But after written submissions regarding Penman were received, they decided instead on a reprimand and ordered him to pay ｣1000 compensation to Cherbi's estate. 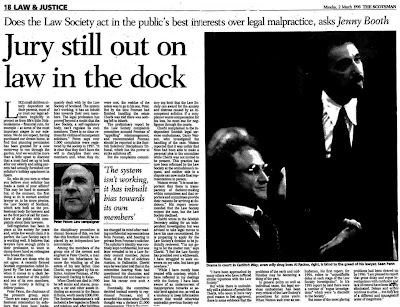 Angry at the Law Society's decision, Cherbi complained to the ombudsman in May 1997. 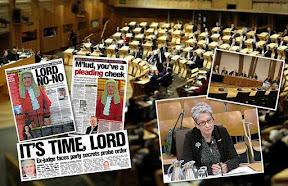 The power of lawyers to discipline corrupt or incompetent colleagues is to be investigated by the Scottish Parliament amid growing concern at the perceived failure of self-regulation in the legal profession. 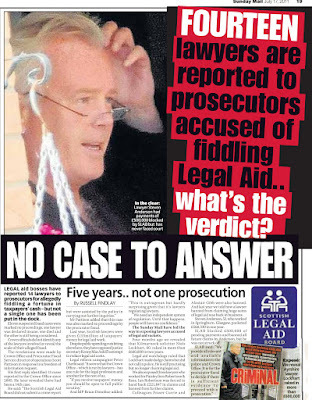 He complained to the Law Society, which originally planned to prosecute Penman. 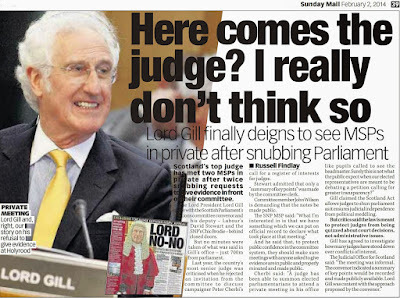 After written sumbissions, it decided on a reprimand and ordered him to pay compensation worth £1000.